Michel Houellebecq, Exhibition views « Quatrains », Air de Paris, Paris, September 15 – November 3, 2018, © Photo Marc Domage, Courtesy Air de Paris, Paris. 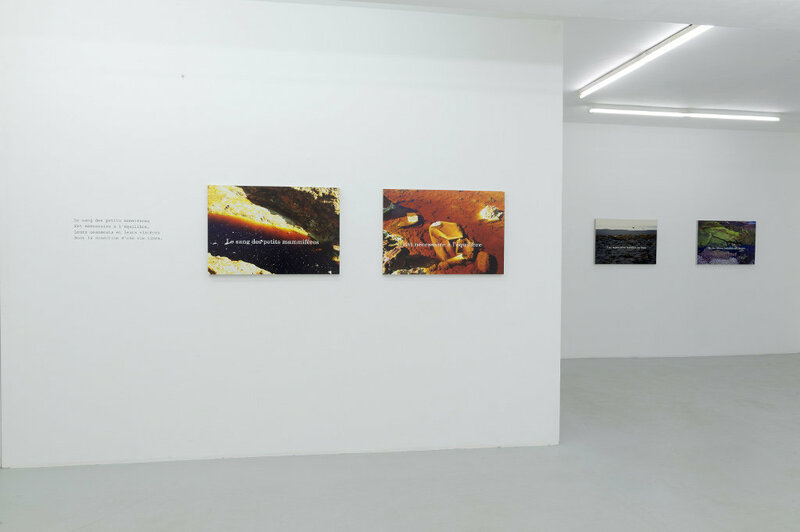 Air de Paris’s exhibition of Michel Houellebecq’s recent works is atypical for its focus on a figure better known for his pessimistic writing, translated into dozens of languages, than for his visual practice. Yet, as French critic Ingrid Luquet-Gad recently wrote, contemporary art has found a renewed fascination for the written word, from the Centre Pompidou’s recently closed “EXTRA!” Festival — an exploration of literature “outside the book” — to the proliferation of artist books and the increasing visibility of artist-writers such as Seth Price or Constance DeJong. Although we won’t cite the long history of contemporary artists engaging with language — Marcel Broodthaers is an oft-mentioned predecessor — a gallery show by Houellebecq still feels incongruous enough. Indeed, Air de Paris has been one of France’s most forward-looking since its opening in 1990 by gallerists Florence Bonnefousand Edouard Merino, graduates of France’s curatorial program Ecole du Magasin. Developing alongside a generation of European art practitioners — Esther Schipper, Pierre Joseph and Dominique Gonzalez-Foerster to name a few — the galleryhas long forged a space of its own in the fluctuating Paris art scene. Michel Houellebecq, Inscriptions #028, tirage pigmentaire (2018) sur papier Baryta contrecollé sur Dibond, 49,5 x 70,5 cm, © l’artiste, Courtesy de l’artiste et Air de Paris, Paris. This isn’t Houellebecq’s first foray into the world of contemporary art: some might remember his encyclopedic 2016 exhibition at the Palais de Tokyo, “Rester Vivant,” for which the poet, essayist, novelist and filmmaker co-curated his own inner-world into a series of installations or “scenarios.” For his first exhibition at Air de Paris, “Quatrains,” Houellebecq has devised a series of wall-mounted images bracketed on each side by audio devices and phrases from the songs’ lyrics. On the headphones one can hear selections from the artist’s 2000 “Présence humaine” album, words echoed in the accompanying lyrics printed on black wall vinyl. This feels pertinent given that the accompanying text cites “framing” as the most important operation for Houellebecq, a kind of delimitation of a section of the world, a poetic whole in and of itself. 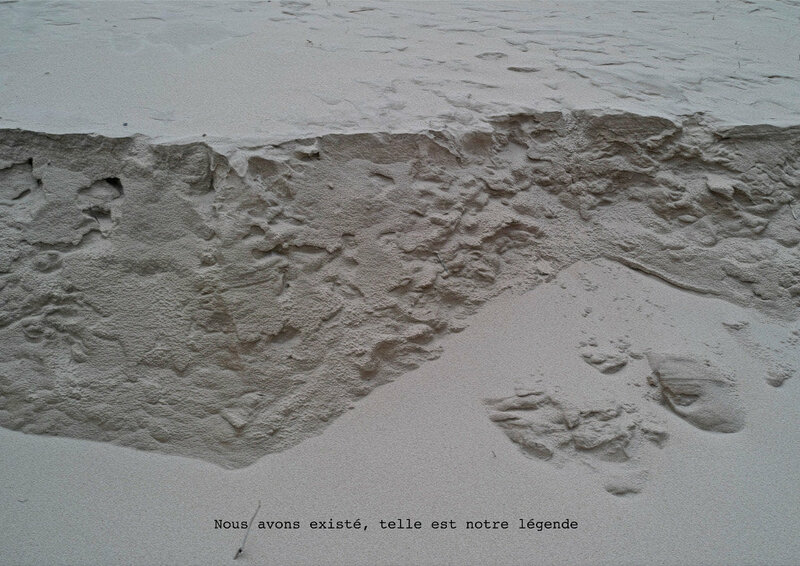 Here, a crumbling segment of sandy beach is associated with the lines “Nous avons existé, telle est notre légende” [“We existed, such is our tale”]. Elsewhere, a placid pool of copper-colored water is accompanied by lyrics evoking a cruel natural order, the “condition of a free life:” “Le sang des petits mammifères/ Est nécessaire à l’équilibre” [The blood of small mammals/ Is necessary for equilibrium]. Other images cite more pedestrian concerns: “we enjoyed moments of unjustified love,” is inscribed beneath a picturesque woodland path. These are poems, as the press release reminds us, preexisting words culled from the artist’s songs which follow strict rules of quatrain verse and rhythm. Their singularity stems from their visual presentation, where verse is situated within Houellebecq’s wider practice, merging song and photography with poetry. What is poetry, we might ask, as it finds itself pasted on gallery walls and images? Though the question feels tired, the exhibition demonstrates the renewed potential of poetry unbound from the plain format of a printed book. 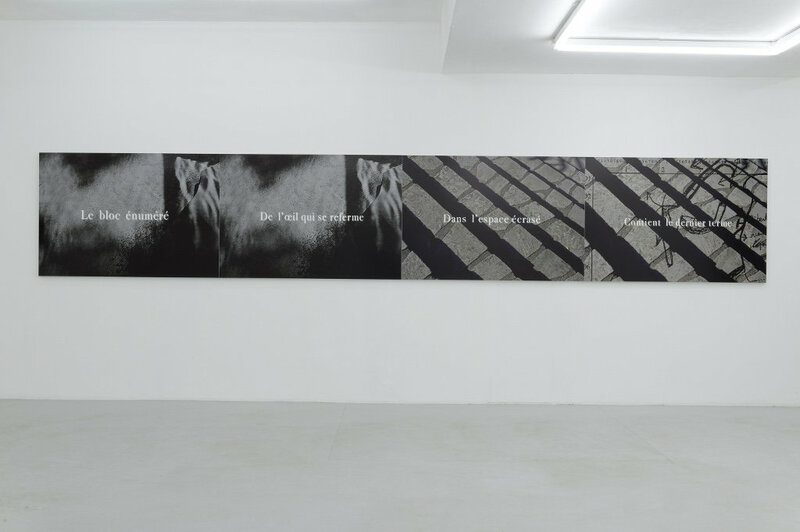 Printed on a photograph, Houellebecq’s poem becomes an “Inscription,” as the works are titled; in song, poetry is fixed in tone. As the pastoral settings of the photographs suggest, this is a conception of poetry as part of a natural system where the human is merely contingent. 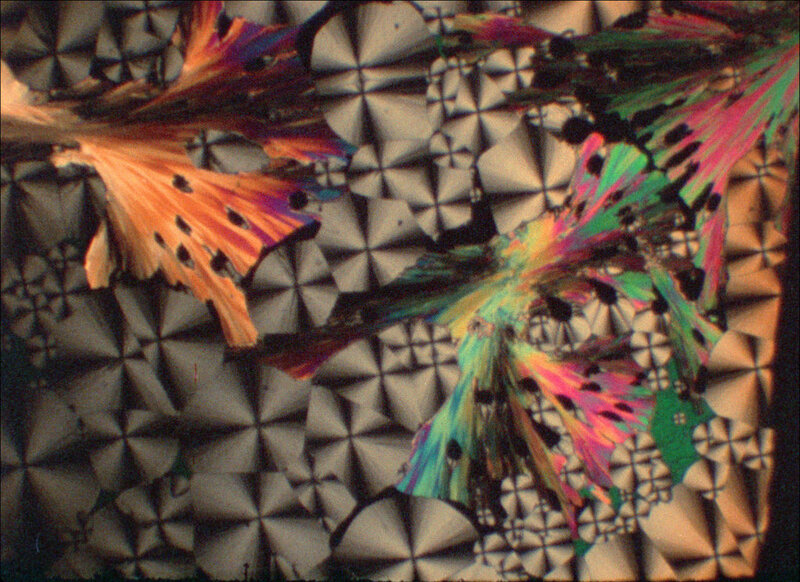 Jean Painlevé, Transition de phase dans les cristaux liquides, 1978, Film 16mm, couleur, son et fichier numérique 2k et Apple Pro Res 422HQ, 6.06 minutes, © Archives Jean Painlevé, Courtesy Air de Paris, Paris. Perhaps most interesting is the gallery’s choice to show filmmaker Jean Painlevé’s 1978 work “Phase transition in liquid crystals” concurrently with Houellebecq’s solo presentation. A lyrical observation of natural crystal patterns, the short film is paired with a dramatic soundtrack composed by the cult composer François de Roubaix, leading to the personification of the crystals. Painlevé’s work draws out the filmic element in Houellebecq — his photographs inevitably evoke screenshots of subtitled foreign-language films — and, ultimately, overshadow the writer’s montages with the discreet charm of the moving image. WHEN: The shows run through November 3rd, 2018. WHERE: Air de Paris, 32 Rue Louise Weiss, 75013 Paris, France.